Miso is a traditional fermented food from Asia that has become more and more appreciated all over the world, as sushi has become a popular fast food – not only for the new flavors it brings, but also for the health benefits a good miso can impart. The miso we find today is nearly always imported from Japan where it is produced in huge modern factories. There are a number of factories that are smaller and produce miso in a traditional manner. Then, there are of course, a few producers making small scale, local, and traditional miso in the USA and Europe as well, such as South River Miso (check my link page). The very best miso, however, is homemade miso, which is not at all difficult to make in your kitchen. Typically miso is made with soybeans, koji and salt, and fermented from anywhere between a couple of weeks to a couple of years. There are also misos made with fish, chickpeas, peas, beans, etc instead of soybeans. Koji is a special moldy mass of rice or barley, but here again, the variations of growing medium are many. You can make your own koji (I have instructions for making koji in a separate page here) or you can buy expert-made koji from a number of companies like South River Miso. Adjust for any amount of miso by taking a percentage of all ingredients. You can also experiment with different kinds of koji, and by changing the proportions, and/or fermenting time. 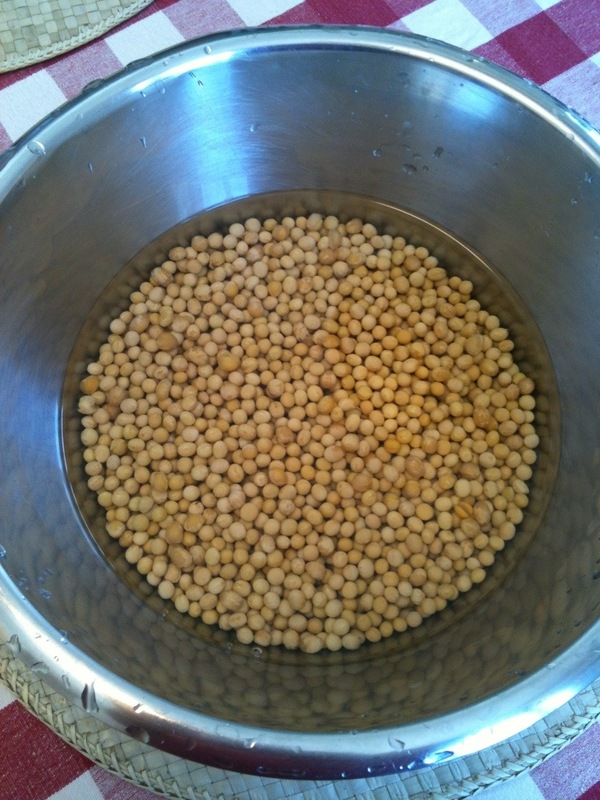 Start out by rinsing and soaking the soybeans for about 6 to 8 hours. In the evening, preferably, cook the beans for about 4 hours watching carefully that they don’t cook over or burn on the bottom. 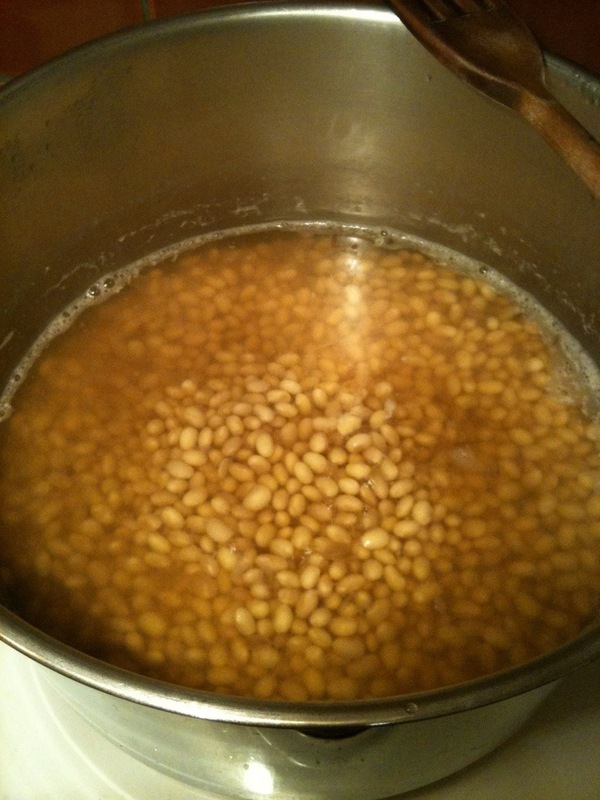 Let the boiled beans sit all night to post-cook and gradually cool down. In the morning mix in all the the koji and salt, and mash this mixture using an immersion blender leaving a few whole beans for looks. You may need a little water to get a good consistency. Pack into glass canning jars and seal tightly so that no air can get in. Label the jars with the type of miso and date. These jars are placed in a warm corner of the kitchen for about a month so that the fermentation can get going. Then they are moved to a cooler place like a food cellar to continue fermenting and aging for two years or more. The miso making season is always during the winter when not much else is going on in the garden. I like to make many smaller batches as in this recipe in order to keep it manageable in the kitchen. 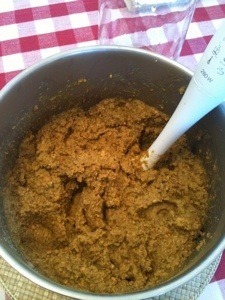 Last years result was about ten liters of different kinds of miso. 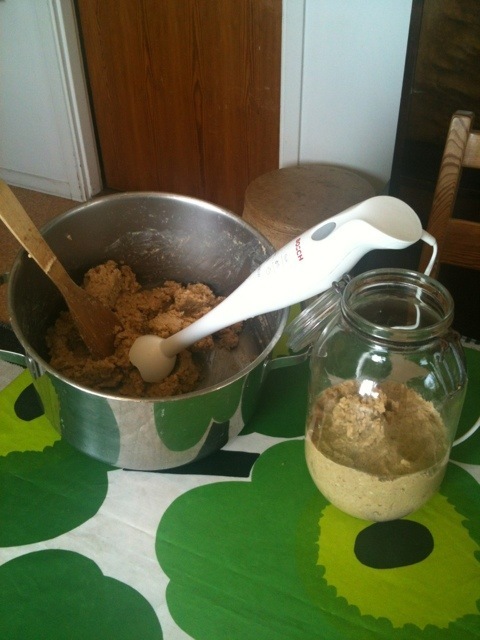 The above picture shows the total of three batches. In the foreground is some ready-to-eat mellow miso from a year earlier. It’s the fermentation that makes the miso. How to make mellow rice miso. Mellow rice miso has more koji and less salt, so it takes only about 1 year to ferment. Follow the instructions as for making rice miso above. How to make sweet white miso. Sweet white miso has a greater proportion of koji, less soybeans and less salt, and takes only about 6 months to ferment – quicker, but with a more lite, sweet flavor. Follow the instructions as for making rice miso above. 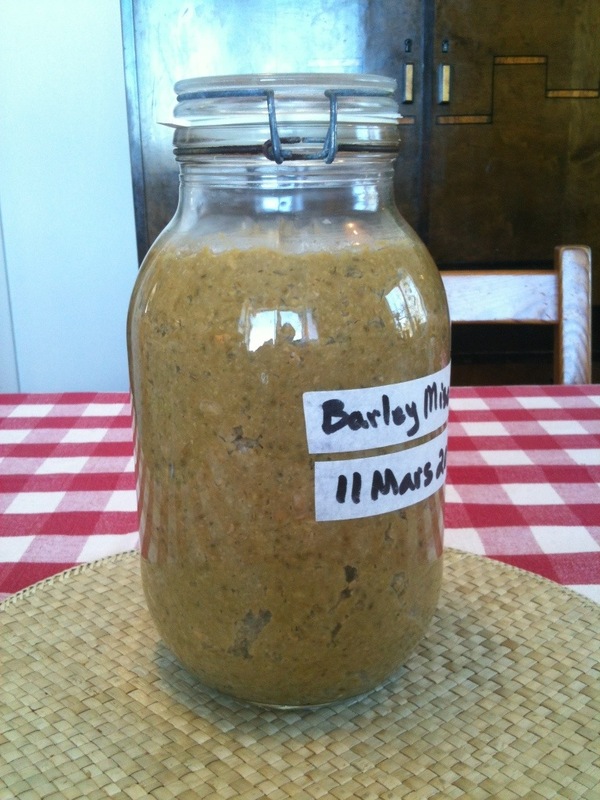 How to make barley miso. Start out by washing and soaking the beans for about 8 hours. Boil the soybeans about 4 hours, keeping an eye on it, especially in the beginning, so that it doesn’t bubble up and boil over. Let the beans cool down. Normally I cook the beans in the evening and then let them sit on the stove overnight to cool down slowly. Mix in koji and salt. Mash with an immersion blender into a fine consistency leaving a few beans whole. Pack into an air-tight canning jar pressing out as much air as possible. But first it has to ferment for 2 years. Leave it in a corner of the kitchen a few weeks to get it going, then take it to a cooler food cellar or such to ferment slowly. This is a true elixir for a gardeners tired bones. This recipe can be adjusted endlessly according to which vegetables, tofu, seaweed and type of miso is available. Sounds alright then. Some alcohol is part of the process. I almost never open until done (only if there is mold growing too much to scrape it off and put new rubber rings for a better seal. I have another question, in my former trials in Miso I registered a strong alcoholic and yeast-like smell after a couple of weeks. Is this normal? There were different stages were the Miso smelled always different (sometimes not really pleasant). I am not sure if the Miso is still good? Not good! But not dangerous either. Too much alcohol is not good for the development of the flavors. Is your salt amount correct? Also, is your jar or container sealed good to keep air out? As far as I know, the salt content should be correct. I made the miso according to “The Book of Miso” by William Shurtleff. But it contains more liquid than your recipe. Yes, the container is good sealed. I use the same “Fido”- Jars like you. But it was a lot of pressure on the jars, so I opened them to release the pressure. At that point, I observed a strong alcoholic smell. you have a great website with lots of useful tips! I just made barley Miso with homemade barley koji. I used coarse sea salt because I had no fine sea salt available. Do you think this is a problem? Also I used a small quantity (1 spoon) of “seed Miso”, which I bought (non-pasteurized barley Miso from Japan). Do you have experience with the use of “seed-Miso”? Coarse sea salt is fine too. I never use seed miso because it is not neccessary and also the micro flora is different in the beginning and end of fermentation. So just let the ambient bacteria etc florish as time goes by. Thanks, I will try it like this, so only the natural bacterial flora. I read somewhere that using sealed containers can be dangerous because the gasses that build up can lead to the container exploding. Do you have to release the gasses every now and then? Or is it safe to leave the container sealed? I am planning on making my miso today, and over the next few days, and I only have a glass container like the ones you used. What is your experience? Many thanks. I’ve heard about that too, but have never experienced such. Once a jar popped/broke open open when it collided with another jar. It was a bit of a mess. And when I open jars I am carefull because the pressure of the gasses can be strong. I do not fill the jars to the top but leave a generous cussion of air. Just be carefull. Do you know anything about the methods for creating koji tane before modern microbiological techniques? I’m curious because I’ve been reading about tempeh, another soy food also made using a mold (Rhizopus sp.). At least according to The Book of Tempeh, as of 1979, most propagation methods were non-sterile and resulted in “mixed” (several mold species + bacteria, perhaps?) that are still viable after very many generations. While techniques may have changed, it certainly shows that reliable that mold culture is possible without a lab. I also wonder if that diversity even allows for that stability, as one of the ecological effects of diversity in both macro- and micro-ecosystems is resistance to invasion. I’m curious if koji was (or even is, at least somewhere) a mixed culture that can be reliably cultured without worry of contamination. I think that presents interesting possibilities for koji “training”; new strains and/or assemblages for different grains/legumes not part of the Japanese tradition, or even different protein sources like dairy or meat directly (without a mediator such as rice flour). Phylogenetic analysis (https://nyti.ms/1VcOWt9) suggests that horizontal gene transfer may been the way cheese making molds gained lactose metabolism pathways (again, before modern science), so maybe the evolution of fermentation organisms might work best (and fastest) with a little help from their neighbors. Remind me later of your ideas. I’ll try to remember to answer you later. Thank-you for the pictures and recipes. I didn’t want to make too huge of miso. I see you are using galleon container. Yes the smaller jars are very convenient for making home miso. 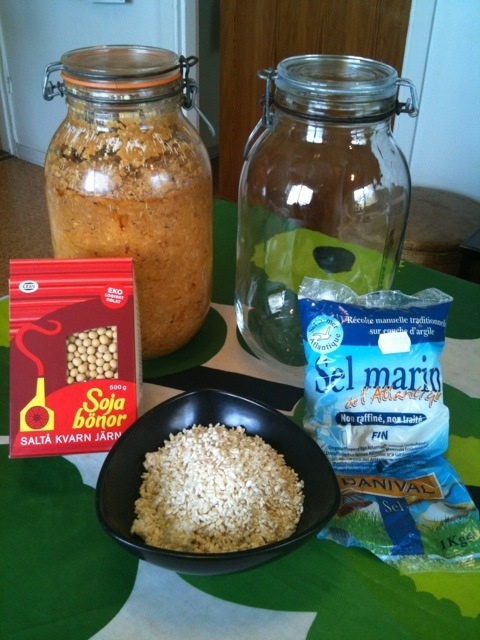 I usualy use the 2 or 3 liter canning jars as seen in the pictures. I thank you for your intrest! cheers for your work its been invaluable for me thus far.just one thing though, i was hoping to know if the koji mentioned in the ingredients list above is fresh ( i’e un dehydrated) or dried? I always dry the koji after making for easy storage, so the weights in all the miso recipes is measured in dry weight. That goes for the soybeans too. Many thanks, Timogarden, for your calm and patient wisdom. Nice! great site you got. I stumbled over it while searching for “good” miso containers. Gonna certainly try the glass jars (with rubber seals). However, since I live close to germany I wonder about your quote “There is a kind of stoneware fermentation jar from Germany with a water lock lid. They are excellent, but the smallest is ten liters”. Could you direct me to a picture or a shop where I might get one? They are Harsch fermenting crocks. Just do a google search for lots of pictures, info and where to buy them. Thanks for this whole post about how to make miso. It’s very inspiring & I’m eager to get started, order my kogi from Red River, etc. I needed to know what’s said at the bottom of this thread: that no bad molds grow on miso. I can’t wait to search the Harsch fermenting crocks but will use a glass jar with special snap lid & rubber gasket if the other is too big. I’m just hoping my small apartment is cool or warm enough to make my own miso. Hi. I started some miso 7 months ago, it was my first batch- so not quite executed properly. It grew mold in the top every few weeks, which I kept scraping off. In the end I left it in the cupboard and let the mold later cover the top. The mould was around 1cm thick. I since returned to the miso to take a look at it’s progress. There is now about an inch of liquid covering the surface (which I understand is normal). However, knowing that there was mould covering the surface previously, and assuming it was now within the miso mix, I was worried the miso was now inedible/ ruined?! I tasted the liquid on top, which seems fine- is sweet, salty and delicious. It sounds like it is good! It seams that there is very little chance that a dangerous mold will grow and spread ‘poison’ into the miso, but I’m not sure if that is thoroughly tested. I always scrape off the mold and eat the rest. It also sounds like you container is not well sealed and air gets in. Good to see someone documenting their process on the internet! I was under the impression that you had to cover the miso in a thick layer of salt for fermentation but judging from your pictures you don’t do that…..have you tried it this way? Sorry if you have answered this elsewhere but have you experimented with legumes other than Soya? Also do you have any recommendations for sources of pre-made rice or barley koji? Thanks and great blog, going to start digging now! Also a follow up question, what condition are the beans in when starting? Are they dried? 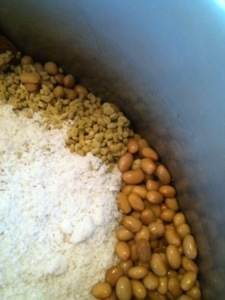 In my miso recipes the beans and koji proportions are given in dry weight. I’m thankful for all questions. I do put a thin layer of salt on the top of each jar of miso, but it’s not necessary if the jar is good and seals tight. I do it just in case. I have tried other beans and peas, but I’ve found that the flavor of soybean miso is far superior. I think the nutritional value is better too. But it is great if you experiment with new varieties. As for sources of ready made koji, I would search the internet. In my link list there is a link to South River Miso who has koji to sell sometimes. Thank you so much! My koji rice is now ready! Thank you again for all the precise details and pictures! May I ask you one more question?….will the miso rise much in the air-tight jar? in other ceramic/or plastic containers, people always have to cover miso then put some weight so the miso doesn’t rise up…. 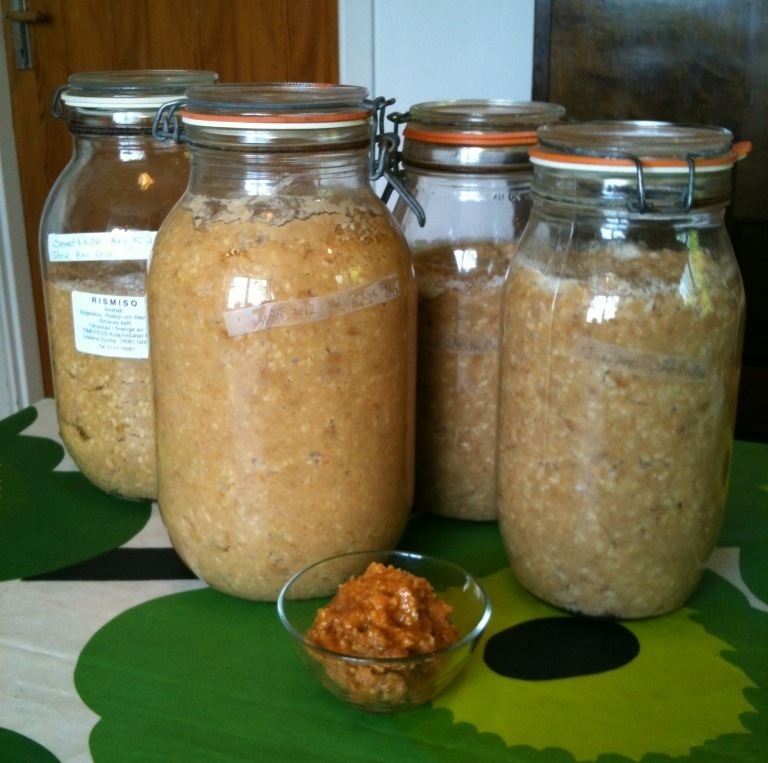 in your pictures, miso don’t seem to rise at all in the air tight jars….is it the air that is pressing it down?…. Thanks a lot again! :D Have a great weeked!! The miso won’t rise much, perhaps about 1 cm in a 2 liter jar. If it’s too warm and very active, it may rise more. I’ve never had a jar break or explode, but it has bubbled over a couple of times. so just leave a bit of space at the top for expansion. The good thing about the rubber seal is that it can let excess pressure out. I think the reason for the weights in the traditional process is to keep the bean mixture under the surface of the liquidy part so that air can’t circulate. This time I wanna try the air-tight jar for the very first time…Can you help me out in clarifying how you close the air-tight lid? you mean pressing hard on the lid (to squeeze out more air)? then, put on the metal security seal?…. Have you ever encounter any explosion of the jar? Is there anything I should be careful about? Thanks for your question! I’m glad for the feedback. And sorry for the lack of clarity. I mean pack the bean mixture in the jar pressing out the bubbles and air pockets as much as possible. Leave an area of air at the top for expansion (an inch or 2). Just put the lid on making sure the rubber lip is not cracked. This air will be quickly expended and replaced by gas by the microbes and cause no more trouble. I have never had a jar break or explode. And no need to put any plastic wrap on top of the miso! How Wonderful ! the plastic wrap is another thing that worries me a bit, as I always wonder if there will be chemicals leaching into the miso. And im not 100% sure about the ceramic or stonewares I can find in the market. Every few years or so there will be news about problem with plastic/chemicals leaching from ceramics/ etc. Glass jars certainly don’t have any problem like that ! They are the safest. Thanks again for so many details and pictures! Thanks. Yes I’ve tried wood and ceramics too, and like the glass jars best. They are just the right size for kitchen production too. There is a kind of stoneware fermentation jar from Germany with a water lock lid. They are excellent, but the smallest is ten liters. A little too big for my scale of production and a bit hard to get. I’ll post about them some day with pictures. It is so interesting to see your post! Thanks for sharing! Does your miso rise up in the air-tight glass jar? I used a regular Manson jar, but the miso was rising up, and the cover became so tight that I started to worry that it might explode in the kitchen one day. I see that most people need to put some heavy stuff on top of their miso. Will I be able to skip that if I switch to air-tight glass jar? I’ve used mason jars for pickles and it worked fine, but never for miso, as I think the metal lid might start corroding when the fermentation takes so long. My miso rises in the jars also, so I put in a little less for more space, and the lids are made to let excess gas out but not in. Sometimes miso juices bubble out too. I’ve never had any trouble except for a bad seal and air getting in causing mold to grow on the top . I just clear it off and use the miso anyway. I’ve read that no bad molds grow on miso.